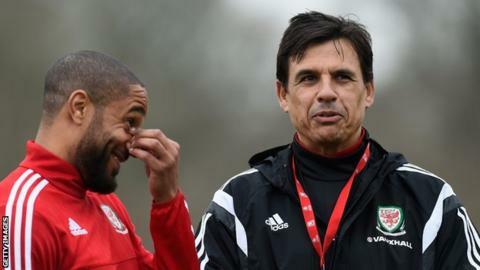 Who has done enough to be picked for Wales' Euros squad? With the excitement building for Euro 2016, all eyes are on Wales manager Chris Coleman as he ponders who to pick in his 23-man squad. He will have to do so at least 10 days before their tournament opener against Slovakia on 11 June, and he has some tricky decisions to make. So following the friendly matches against Northern Ireland and Ukraine, I've analysed which players have forced their way into the squad and those who could miss out. Those friendlies were a chance for players to nail down their places in the squad, and I think a few really took their opportunity. Fulham winger George Williams looked sharp against Northern Ireland and he looks like he's benefitted from getting more game-time on loan at Gillingham under former Newport boss Justin Edinburgh. With his pace and trickery, I think he could have a big impact from the bench in France this summer. It's a similar case for Jonny Williams. We all know how talented the Crystal Palace midfielder is, and it's good to see him playing regularly on loan at MK Dons. He would bring creativity to the squad, which could be crucial if someone like Ramsey picks up an injury. Both George and Jonny Williams have been unlucky with injury, as has Emyr Huws, who I would also take to France. The Wigan midfielder has impressed on loan at Huddersfield this season and I thought he was excellent alongside Joe Allen against Ukraine. I would also pick young Walsall striker Tom Bradshaw. He may be playing in League One but he's a prolific goalscorer and, as he showed with his substitute appearance against Ukraine, his movement in the box could make him a surprise package for Wales. Coleman will have to make some tough decisions as he chooses his squad of 23, and the hardest bit of all will be telling some players that they have missed out. I think Nottingham Forest midfielder David Vaughan will be one of those unlucky players. He is neat and busy but central midfield is one of the most competitive areas in this squad and I think he's a bit too similar to midfielders such as Allen. Tom Lawrence, currently on loan at Cardiff from Leicester, is another who may just miss out. I thought he did well in his first start against the Netherlands in November but he struggled against Northern Ireland and Ukraine. I don't think there will be room for Newcastle defender Paul Dummett, mainly because injuries have meant he's had to withdraw from a few squads. The likes of full-backs Adam Henley and Adam Matthews, as well as midfielder Shaun MacDonald, just didn't have enough time on the pitch to make an impact.